How do hand dryers work? Hygiene: Do hand dryers spread bacteria? 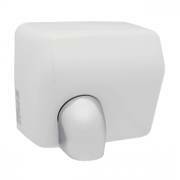 Hot air handdryers are perfect for use in bathrooms in culinary establishments (e.g. restaurants), sanitary facilities in nightclubs, swimming pools, cinemas and a multitude of other public buildings. Tip: If hand dryers can only be mounted in corners or other inaccessible places due to lack of space, an adjustable hot air nozzle comes in handy. With a width of 25-30 centimetres most of our models are suitable for small premises as well. The hot air nozzle immediately begins to operate as soon as the sensor detects movement underneath. There is no time delay and it is not necessary to frantically move the hands up and down to finally activate the dryer. According to the manufacturers, ECO models save up to 70% energy in comparison to conventional hand dryers, and up to 97% of operational expenses compared to paper towels. 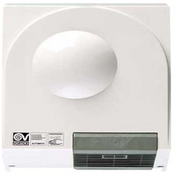 The basic principle of hand dryers is similar to a blow-dryer: The units take in ambient air through a fan wheel (impeller), warm it up with an electric heater coil and then blow it out with a velocity of up to 5800 revolutions per minute. The users then simply hold their hands underneath the opening, turning and moving them in the warm stream of air and soon all fingers are dry again. The process is slightly accelerated if the wet hands are shaken off in the sink beforehand. 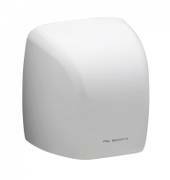 In our range we only offer hot air hand dryers that work with evaporation. It only takes between 12 and 30 seconds until about 95% water has vanished into thin air. The exact specification is available in each product description. A long time ago, hand dryers were discredited as spreading bacteria. Properly used and serviced units of the new generation considerably reduce the number of germs. Today, these systems are rated as hygienic, meaning electric hand dryers can be applied in public facilities without hesitation. 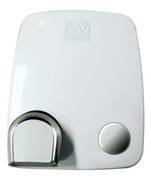 The automatic models in our range have an integrated infrared sensor that detects motion which allows a contactless activation and even higher hygiene standards. A further increase of cleanliness is provided if the air intake is passing a filter before being discharged onto the hands. It is not unusual for guests to take an unnecessarily large quantity of paper towels, resulting in wasteful usage. It is also not unusual for the used towels to be thrown in the sink, the toilet or on the floor. Once wet, the paper towels begin to soak all materials they contact – an unaesthetic sight. In order to produce cellulose products, a disproportional amount of water is required, furthermore pollution of the air and a high consumption of energy are part of the process as well, and finally waste is incurs again. However, not only the aspect of waste disposal makes a modern hand dryer an attractive alternative, particularly their energy efficiency is interesting. The energy consumption is much lower than all costs for purchase, refilling and waste disposal of paper towels.
? 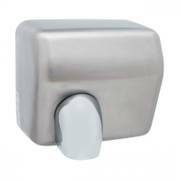 Both towel dispensers and electric hand dryers are subject to vandals‘ lust for destruction, though a hand dryer is protected by durable robust housings rated IK 10. 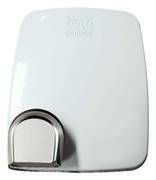 Our hand dryers are available in different variations regarding performance, volume, impact and water ingress protection, so you are guaranteed to find the right model for your needs. 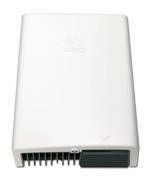 The energy consumption from 1000 Watt and upwards is environmentally-friendly and allows even faster drying. An integrated safety device prevents overheating. Guests in public sanitary facilities are grateful for the completely contact-free operation of motion sensors. The responsitivity of the infrared sensor is adjustable in most cases. The dryer automatically shuts off as soon as the hands are moved away. Another mode of operation is the push button. The duration of the blowing can be adjusted individually to economise power consumption. The units shut off after 60 seconds at the latest. 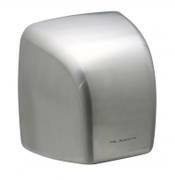 First-rate materials ensure durability of the hand dryers. Scribblings, soap remains, etc. are easily removed from the stainless steel metal housings. Finger prints and scratches are not as obvious on brushed stainless finishes as they are on polished models. Housings made from ABS plastic are robust and impact-resistant, too. The synthetic material is resistant to yellowing and can be cleaned with water. The hand dryers have been carefully designed and are a chic addition to the washroom, a feature that sets them apart from no-name products. All models are equipped with a protection rating against water ingress and humidity and come with a 2-year warranty. The noise emission during the short drying time is engineered to be as low as possible. Whenever air is transported with high pressure, operational noise is bound to occur. You can choose the maximum noise level with our product filters. The English P+L Systems brand has been exporting goods to over 80 countries since 1984. The Italian manufacturer Vortice was founded in 1954 and is one of our “oldest“ partners. 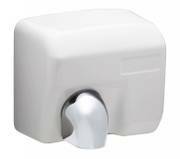 Both companies have gained immense expertise when it comes to producing reliable hand dryers. Unfortunately, washroom equipment in public facilities is subjected to damage. But vandalism is not to blame in all cases, careless handling of public property can affect appliances of all kinds over the course of time. The IK code rates the housing stability against mechanic stress and impact loading. The impact energy is expressed in the measurement unit Joule. One Joule energy is required to lift a weight of 100g (rounded value) one metre above the ground. The vandal-proof models are a particularly good choice for every day use. Thanks to a massive (die-cast) housing and robust nozzles these devices withstand rought handling. 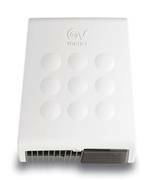 Naturally there are units with contact-free infrared sensors, ensuring a high level of hygiene. 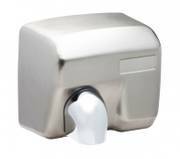 More information about hand dryers is available in our guide section .